Editor’s note: The following post by Jeremy Sprinkle, communications director at the NC State AFL-CIO, is the latest installment in “Raising the Bar” — a new series of essays and blog posts authored by North Carolina leaders highlighting ways in which North Carolina public investments are falling short and where and how they can be improved. No one wants North Carolina to have a strong economy more than its workers, who want to be able to work and to earn enough to support their families. Our state budget includes vital investments in supporting our current and future workforce, for example through workforce development, re-employment support and early childhood education, and our K-12 public school system. We know that making investments in these areas ultimately benefits all workers, families and our economy. Unfortunately, legislative leadership in North Carolina has not pursued a path of investing in our workers and future workforce, but instead implemented a costly tax plan passed in 2013 that bleeds the state of much needed revenue for workforce development and training and innovative, proven initiatives that would create good-paying jobs in our state. The plan they passed gave big tax cuts mostly to profitable corporations and individuals at the very top of the income scale. Legislators based the pursuit of this strategy on a theory that tax cuts lead to higher job creation. However prior experience and research tells us that tax cuts don’t create jobs and they don’t grow the economy. The 2013 tax cuts haven’t fixed the labor market despite disproportionately going to so-called “job creators” – the wealthiest North Carolinians and profitable major corporations. As billionaire venture capitalist Nick Hanauer has said, if it was true that tax cuts for the rich created jobs, we would be drowning in jobs — but we’re not. There are more people looking for work today than before the recession, and many of the jobs out there are low-wage jobs that don’t pay enough to support families or to reverse the decline of our middle class. In fact, adjusting for inflation, an hour’s work today actually buys less than it did in 2007. Another tax cut isn’t going to fix that. The way to raise wages and fix the labor market is by investing in our workforce and by empowering more workers to engage in collective bargaining to turn low-wage jobs into good jobs. Policymakers have for too long asked working families to pay more and settle for less. The 2013 tax cuts for the wealthy forced the state to slash programs that would have helped workers recover from the recession and rebuild their lives. Workforce development, reemployment services, child care subsidies, and the Earned Income Tax Credit have all been cut or eliminated. Meanwhile, the cost of job training at community colleges or of pursuing a higher education is more expensive than ever. Workers are consumers, and that makes us the real job creators in our economy. There aren’t enough wealthy people to make up for the declining buying power of North Carolina’s workers, and another tax cut for the rich won’t change that. If lawmakers want to create jobs, they need to invest in workers, and investment takes revenue, revenue that is lost by cutting taxes. And if they want to do something meaningful to put more money into workers’ pockets, they’d be better off encouraging workers to form unions and bargain collectively than by doubling down on the failed ideology that tax cuts are some sort of cure-all that past experience and common sense tell us just isn’t true. We have been highlighting the views of experts about where North Carolina needs to invest to have the maximum impact and will continue to do so throughout the budget debate. The combined potential of smart spending with adequate revenue can improve the state’s economy and ensure more people can contribute to the activities and institutions that make our state great. There has been very little, however, to suggest that policymakers are willing to tackle the challenge of a tax system that no longer is capable of supporting the core public services that deliver opportunity. Instead, there continue to be proposals to cut the income taxes and shift limited revenue around without addressing the fundamental issue that there are too few dollars. As we have written about at Prosperity Watch, the state’s revenue is not only coming in far below projections it is growing far below historic averages. The result is that today we don’t have the revenue needed to invest for our future. And in that future we can anticipate ongoing self-inflicted revenue challenges unless policymakers address the inadequacy of our tax code. North Carolina is not broke. There are the resources to make a commitment together to building that foundation. It will require that the state’s wealthiest residents—who have captured the entirety of income growth since the recovery began—and profitable corporations—who continue to reach record profits—contribute according to their ability. They, like the state, stand to benefit. After all a stronger economy is possible when more Tarheels are educated, more businesses have skilled workers, more main streets have vibrant small businesses and more communities are safe and healthy places to live. Here are some of the big picture ideas that policymakers should consider in developing a tax system that can achieve our shared goals of strengthening the state’s economy and supporting families and communities across the state. Restore an income tax rate structure that ensures that all taxpayers carry an appropriate share of the tax load. This could provide $390 million if you keep the current 5.7% rate for the majority of taxpayers and add two brackets for the wealthiest in the state. Restore a vital tax credit for low-income working families before expanding the sales tax any further. Make sure that large, profitable corporations are paying to support the services they use and benefit from. This could provide $200 million if the corporate income tax rate is set at 6 percent which is in line with the region. Eliminate special-interest tax preferences that aren’t helping the state’s economy. North Carolina has the capacity to make sure that our investments can grow an inclusive and strong economy. Policymakers just need to recognize—as they have done in the sales tax allocation debate—that revenue serves as the mortar in the foundation to supporting a vibrant economy. Editor’s note: The following post By Dr. Mark Edwards, Superintendent of the Mooresville Graded School District, is the latest installment in “Raising the Bar” — a new series of essays and blog posts authored by North Carolina leaders highlighting ways in which North Carolina public investments are falling short and where and how they can be improved. “How are you doing on your reading?” the superintendent followed up. “Fantastic!” the young man replied, smiling. “Here, I will show you my report.” The student then pulled up a personal profile spread sheet of his reading results. “Well, yes I do,” the superintendent replied. “Well good then. I will show you my trajectory… See that green line above the blue line? That’s my trajectory. That’s where I’m headed,” the student explained. “Do you think you can do it?” the superintendent asked. I am encouraged that Gov. Pat McCrory is focusing attention on beginning salaries and funding some efforts to recognize teacher-leaders. In order for North Carolina to actually compete with other states, however, we need to look for significantly broader support. In Mooresville, we are known for our digital conversion and for excellence in student achievement. The absolute key to our success is the human infrastructure of great teachers, principals and staff going above and beyond the call of duty day after day and year after year. When we recruit against surrounding states like Virginia, South Carolina, and Tennessee, we are facing a six to ten thousand dollar salary disadvantage. Gov. Pat McCrory’s budget proposal for the years 2015-17 offers a welcome change of direction in the area of behavioral health services, which would see spending increase by 1.5 percent compared to current law. Though far from what is really needed, this modest increase would be a real turnaround from years past when lawmakers imposed significant cuts to programs and direct services as a way to balance the budget and make up for revenues lost to tax cuts. We are pleased to see the Governor’s support for restoring some funding to the health and human service budget to serve citizens with mental health, intellectual or developmental disabilities, and substance use disorder services. In addition to stopping most of the bleeding, this money would help the state to catch up on at least some of what was lost during the recession and begin to rebuild to address current needs. Furthermore, over the past few years, lawmakers enacted provider rate cuts year after year. Under the Governor’s plan, there are no further provider rate cuts. 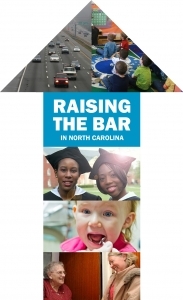 Editor’s note: This is the latest installment in “Raising the Bar” — a new series of essays and blog posts authored by North Carolina nonprofit leaders highlighting ways in which North Carolina public investments are falling short and where and how they can be improved.We need an energy system that protects our vital resources and creates sustainable jobs. The good news is that North Carolina has great potential for such a system. The bad news is that the current budget takes us further from that goal, not closer to it. The ongoing discussions of the 2015-2017 state budget provide a useful context for analyzing the health of our state’s economy. The budget’s treatment of the environment makes clear just how shortsighted the planning for economic development is in this state. Over the last several years, rather than pursue the myriad opportunities to leverage clean technology and innovation to protect our environment and spur job growth, the state budget has ignored the need to protect our state’s most valuable resources. Since the Great Recession of 2008, cuts to North Carolina’s primary environmental regulatory body have constituted a wholesale assault on our state’s living environment. The scale and pace of cuts to the Department of Environment and Natural Resources (DENR) represent a structural dismantling of numerous regulatory bodies, diverting systems of revenue generation for the foreseeable future. If continued, these trends could spell disaster for North Carolina’s families. Instead, we should pursue a budgetary structure and job creation scenario that benefit both our economy and the planet by investing in renewable energy and energy efficiency, remediating current environmental degradation, and repairing existing infrastructure. Our current reality, however, is far different. In 2009, 30 positions were eliminated from DENR. Over the next two years another 225 jobs were cut, but in Gov. Pat McCrory’s first year of office, while the economy was supposedly in recovery, another 131 positions went to the wayside, with 1,500 additional positions transferred out of the department over that same four-year period.